A 20-year study finds that millennial children in Southern California breathe easier than ones who came of age in the ‘90s, for a reason as clear as the air in Los Angeles today. The University of Southern California Children’s Health Study measured lung development between the ages of 11 and 15 and found large gains for children studied from 2007 to 2011, compared to children of the same age in the same communities from 1994-98 and 1997-2001. By following more than 2,000 children in the same locations over two decades and adjusting for age, gender, ethnicity, height, respiratory illness and other variations, the study provides stronger evidence that improved air quality by itself brings health benefits – benefits which last a lifetime for children breathing cleaner air during their critical growing years. Key findingsCombined exposure to two harmful pollutants, nitrogen dioxide (NO2) and particulate matter of diameter under 2.5 microns (PM2.5), fell approximately 40 percent for the third cohort of 2007-2011 compared to the first cohort of 1994-98. The study followed children from Long Beach, Mira Loma, Riverside, San Dimas and Upland. 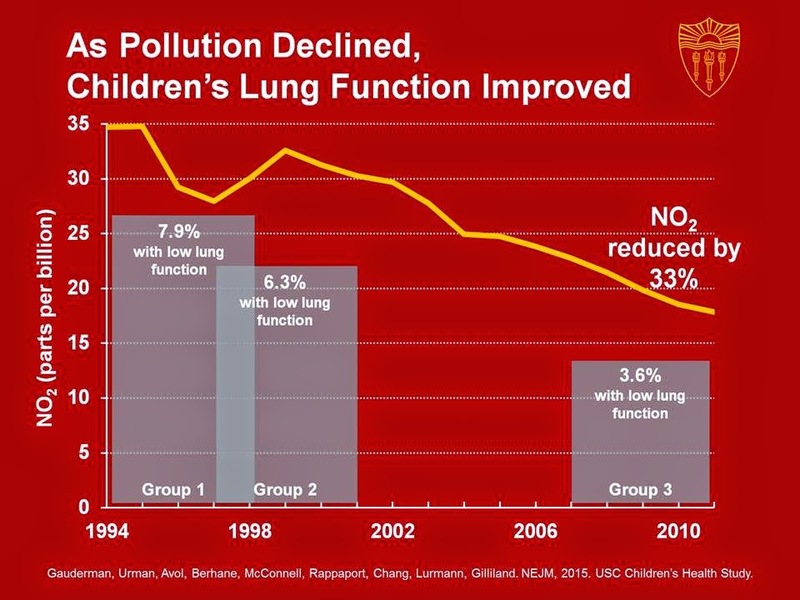 Children’s lungs grew faster as air quality improved. Lung growth from age 11 to 15 was more than 10 percent greater for children breathing the lower levels of NO2 from 2007 to 2011 compared to those breathing higher levels from 1994-1998. “Reduced lung function in adulthood has been strongly associated with increased risks of respiratory disease, cardiovascular disease, and premature death," said Gauderman. 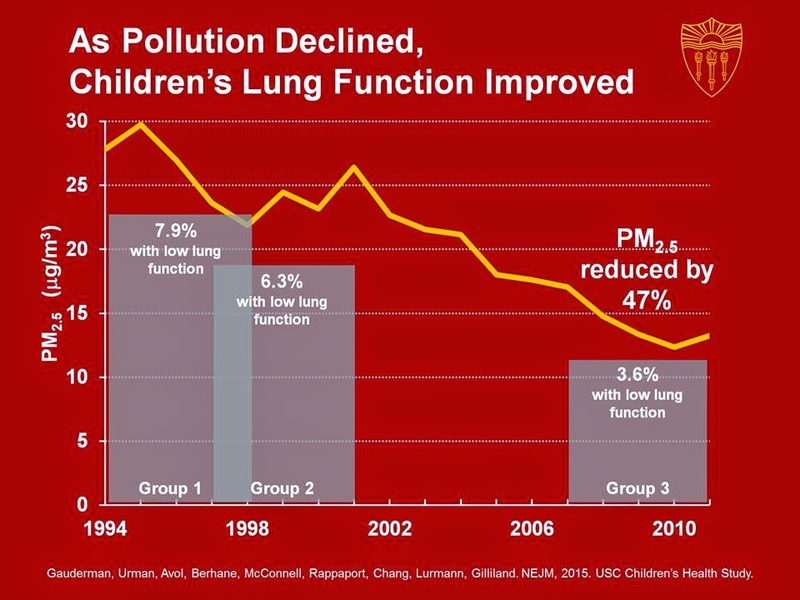 "Improved air quality over the past 20 years has helped reduce the gap in lung health for kids inside, versus outside, the L.A. basin." Broad benefits from better airLung development measured by the study improved across the board, regardless of education, ethnicity, tobacco exposure, pet ownership and other factors. “It’s an environmental success story. The air has gotten much cleaner than it was in the past. I grew up here in the ‘70s. Even from Pasadena you couldn’t see the San Gabriel Mountains on a typical summer day,” Gauderman said. The study’s third cohort of 2007-11 also came of age at a fortunate time for respiratory if not financial health. The economy shrank and emissions fell during the Great Recession. “Our results suggest that better air quality in future will lead to even better lung health,” Gauderman said. Gauderman’s and Gilliland’s co-authors were Robert Urman, Edward Avol, Kiros Berhane, Rob McConnell, Edward Rappaport and Roger Chang, all from the Department of Preventive Medicine at the Keck School, and Fred Lurmann of Sonoma Technology, Inc.